This is the story of one of America's truly great institutions, "Grand Ole Opry", important because it is the focal point of genuine American folk music. 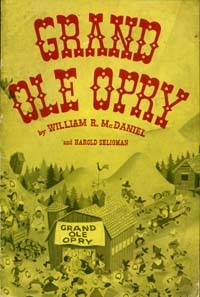 For more than a quarter of a century, this "Hillbilly Heaven" show has been performed in Nashville, Tennessee and broadcast over WSM, Nashville's famous radio station. It is the oldest continuous radio program in the country, and one of the most popular. Every Saturday night, year in and year out, more than ten million people listen to this group of players and singers whom they have come to know and love. Here you will find the whole story of this unique musical showhow it all began and why it has grown to such mighty proportions. And you will also find a listing of favorite Opry songs, and stories and pictures of all the leading stars of the Opry, past and present, whom America has taken to its heart.